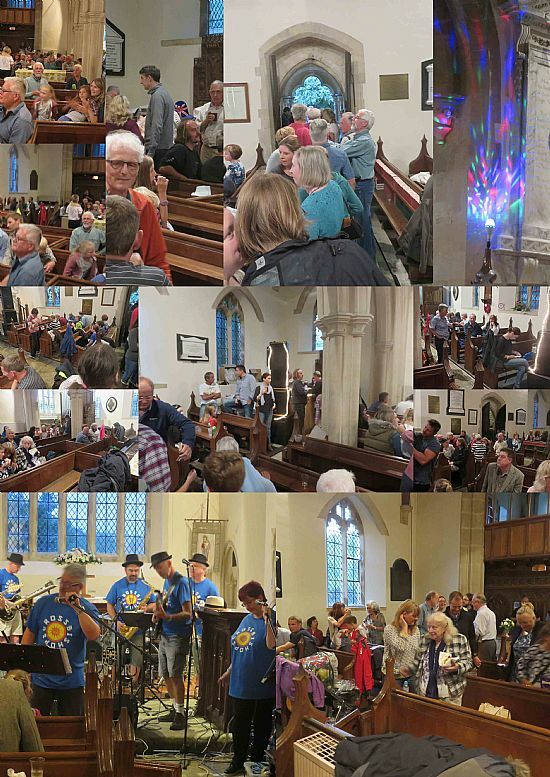 Cross Connections is a voluntary community group, formed to get people together in Cross, Compton Bishop, and Webbington, organising events for the whole community whatever their age. Cross Connections now has a brand new Facebook group up and running! The below link should work or you can just search for Cross Connections. If you use Facebook you can keep up to date with events and happenings. 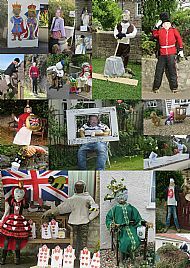 The Scarecrow competition saw the village well decorated with some very imaginative interpretations of the 'Royal' theme. 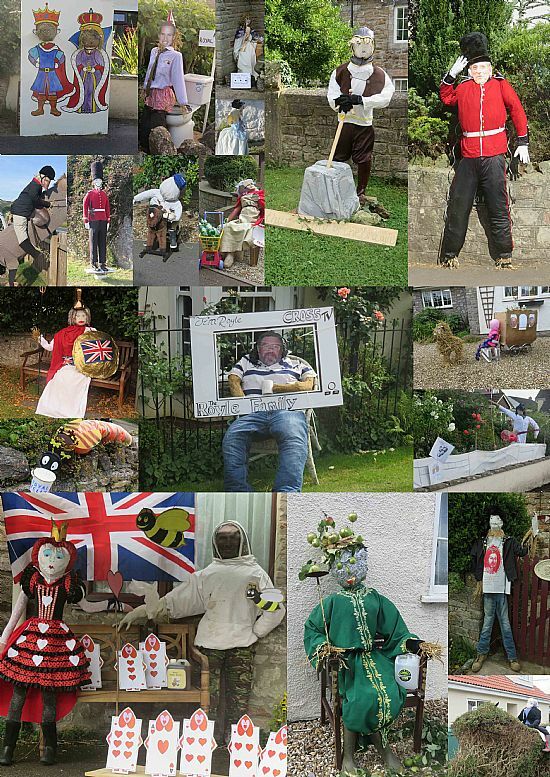 The winner was 'Apple Queen outside Bowyer House next to The New Inn. Despite the strong winds blowing down the marque - and the stalwart organisers rapidly booking Weare Hall for the Village Show which was very well attended. A lovely and enjoyable wildlife walk and pic-nic in Cross Quarry was well supported and with lots of families enjoying the hot sun. With the marque unusable the Hog Roast and live band's venue was changed to St. Andrew's Church - greateful thanks to Rev. Judith. This was something else - a terrific venue and super music by a very accomplished band in a magnificent setting. On Sunday the breakfast and Church service was a fitting start to Sunday and well attended. 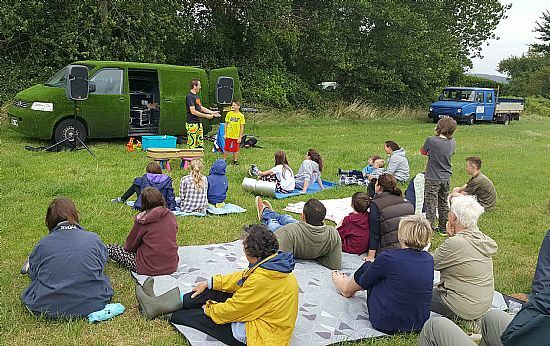 On Sunday afternoon the Village Fun day began with 'Nutty Noah' entertaining both children and adults with some hilarious and clever moments. This was followed by the Rounder’s Challenge - and Cross managed to take the lead and win the cup from last year's winners - Compton Bishop. The coconut shy and sponge soaking proved a great hit. It was lovely to see so many new faces. Cross is in a fantastic position, right under the Mendips, and lots of great people live in the village - but we don't have enough facilities to serve the community. Most people have to get in their cars to get to play areas, shops, cafes, to play sports and go to work. As a result, we don't get to see each other very often. Several families came together with common concerns, to see what can be done to solve the problem. We started meeting in May 2008 to plan actions that would bring people together and generate ideas and support.